1. I am enclosing the latest portfolio of Rakesh Jhunjhunwala and one can take the same as a guideline and should not buy it aggresively as it is very difficult to establish that at what price Mr Rakesh Jhunjhunwala has bought these stocks. 2. 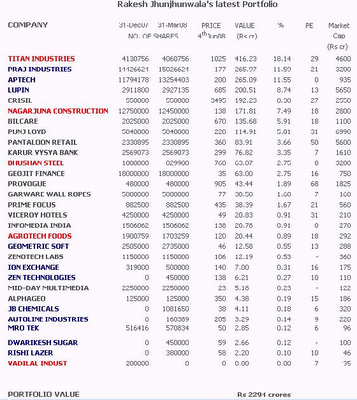 Blue colour denotes stocks where his holding has gone up and red colour denotes stocks where his holding has gone down. Always remember to use your personal discretion while following his tips as he is a big fish in large sea of stock market. Do remember to check Rakesh Jhunjhunwala Portfolio 2011 and realign your portfolio accordingly.